Learning how to play blackjack in a casino gives a gambler access to the casino game with the best house odds, from a player’s perspective. Blackjack is a game of skill, where strategy and research make a difference. Blackjack is an exciting table game because it attracts smart bettors who understand the game can be profitable in the right circumstances. Practicing blackjack tips prepares a gambler for the most entertaining casino game, whether they play blackjack online for real money or visit a brick-and-mortar casino’s blackjack tables. Planet 7 Casino is the best casino for playing real money blackjack online. They offer 7 different versions of 21 for you to enjoy. Sign up using the button below and you will receive up to a $777 bonus when you make your first deposit. The decision of where to play blackjack is important because different online and offline casino have wildly disparate rules. Blackjack rules affect the house edge, so when you’re playing for real money, the house rules are as important as learning the basic strategy or card counting. Blackjack in land-based casinos might offer advantageous single-hand blackjack, but have other rules which make the 6-hand blackjack table next to it a better game. Playing blackjack online all-but-eliminated card counting, because of automatic reshuffles on each hand. Live dealer blackjack allows online card counters a chance again. Whichever blackjack variant you choose to play, remember to study a basic strategy chart and practice blackjack online for free. Card Counting: Land-based casinos deal cards from a shoe, with 75% penetration of the deck, so card counting works. Live Betting: Playing live blackjack in an opulent brick-and-mortar casino is glamorous and fun. Camaraderie: Blackjack in a land casino allows people to socialize with fellow blackjack players. Inconvenience: Many Americans live more than 100 miles from a land-based casino, making gambling difficult. Cost: Trips to casino destinations are costly, involving hotel rooms and airfare. Also, no welcome bonuses. Less Selection: Even big land-based casinos might not have your favorite blackjack rules. Bonus Promotions: Online casinos have welcome bonuses, table game bonuses, and reload bonuses. Huge Selection: The best online blackjack casinos have dozens of blackjack variants. Live Blackjack: Live dealer blackjack allow real-life card hands, as well as card counting. No Card Counting: Random number generators reshuffle the blackjack deck each hand, so no card counting works. Quicker Hands: Online blackjack allows rapid-fire hands, increasing the effect of the house edge. Limited Access: Depending on the jurisdiction you live in, playing options are sometimes limited. Given the sheer number of choices, playing blackjack online for real money is the best choice for blackjack players. The benefits of playing blackjack online are legion: online blackjack casinos are more convenient, offer more and better rules, and have more ways to play blackjack games. Mobile blackjack means you can play anytime during the day and anywhere you go. Multi-hand blackjack with the maximum hands and bet limits provides the biggest thrills for high roller blackjack players. If you want to count cards, playing online blackjack with live dealers allows a card counter to keep a count with a computer program and without being seen by the dealer or pit boss. Card counters should choose the best blackjack online casinos with the live dealer option because it’s how you make money playing blackjack online. Learning how to play blackjack is easy. Playing a hand of blackjack is not hard, compared to other games. The basic rules are easy to follow, though mastering how to win at blackjack is a bit harder. This blackjack 101 guide provides the basic rules of blackjack and a few tips to make help you improve your game. If you play for real money against a live dealer, you’ll want to memorize a basic strategy chart for the specific rules you use. If you play at a live casino online, keep a basic strategy chart next on your desk or in a separate tab for easy reference. Basic blackjack rules do not include card counting, so that skill requires additional study. Blackjack Rule 1 – Player vs. Dealer: Each player at the blackjack table is matched against the dealer. You don’t compete against other blackjack players. The player goes first, meaning you can bust first, which provides the house edge. Blackjack Rule 2 – Closest to 21 Wins: The hand which is closest to 21 without going over wins. If you get 22 or more, you bust. If you get 21 with the two-hole cards, it is called a natural twenty-one or blackjack. Blackjack Rule 3 – Splitting Paired Hands: If you receive two cards of the same value on a deal (2-2, A-A, J-J), you can split the cards into two hands in most games. Basic strategy charts explain when it is advantageous to split cards. Blackjack Rule 4 – Double Down Bet: After the deal, a player who thinks he or she has an advantage can place a second bet for the same amount as their ante bet — a process called doubling down. Strict rules determine whether you can double down after splits. Blackjack Rule 5 – Hitting on Soft 17: When a player wants another card, it is called “hitting”. Dealers hit, too, and one of the most important rules is whether the dealer hits on a soft 17. Note: “Soft” is a hand with an Ace, meaning it can’t bust. A blackjack basic strategy chart gives a player the right move on every single hand combination. These blackjack cheat sheet charts are designed using computational simulations on millions, perhaps billions, of hands. Therefore, a blackjack hit-or-stand chart is a mathematical breakdown of the optimal play. Whether you play blackjack online or in a brick-and-mortar casino, it helps to have a basic blackjack hand chart at your side. Remember that basic strategy charts exist for every single rule combination, so optimal play is only achieved if you memorize the right chart. The best way to learn basic blackjack strategy is to learn the game online first for free, then play blackjack for real money. The house edge in blackjack is the probabilistic advantage a casino has over the player. Learning basic strategy does not change the blackjack odds of winning, but it helps a player achieve optimal play, meaning the stated house edge is the effective house edge. Understanding the blackjack house edge helps you understand the odds you face, while helping you select the correct version of blackjack to play. Each rule either positively or negatively affects your chances of winning at blackjack, so study how each rule affects your blackjack odds. Also understand that the casino’s house edge exists every time you play, unless you use card counting to gain an advantage. The blackjack house edge is explained further below, as I discuss how each blackjack trick helps a blackjack player succeed. Basic Strategy: Basic strategy does not give you the advantage. It assures a 0.50% house edge doesn’t become a 2.50% house edge. Mastery basic strategy charts help you achieve optimal play. Money Management: Money management techniques teach a player how to handle their bankroll. A key concept to learn is determining the size of your bankroll and setting how much you should wager on each hand, but loss limits and win goals are important for maintaining discipline and focus. Using loss limits, bankroll management is key to stretching your gambling budget until luck comes their way. Using win goals, money management helps players lock in winnings when they have big winning sessions. Card Counting: Once you achieve optimal play, card counting helps you vary your bets at advantageous times, giving you the advantage over the casino. Card counting plus basic strategy helps you gain a 100%+ return to player (RTP), which is why casinos don’t like card counters. 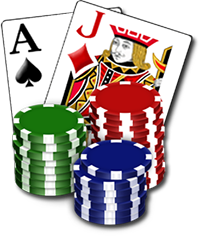 Play blackjack at home in practice mode allows a player to master the basics. Like in sports, winning play for beginners learning how to play blackjack isn’t about brilliant moves, but about eliminating careless mistakes. When you first play blackjack in a casino, your goal should be to learn how to avoid mistakes. Avoiding mistakes helps a player achieve optimal play, because less-than-optimal play leads to more losses, whether you play in online or land-based casinos. With study of a basic strategy chart, you’ll learn how to play blackjack and win at black jack. To win consistently at blackjack, but all your knowledge together to learn winning strategies, use good bankroll management, and avoid blackjack mistakes. The worst blackjack mistakes happen when you’re misinformed. You might read an article named “How to Win Blackjack without Counting Cards” and the writer might discuss betting tips that sound reasonable, but actually hurt your chances of winning in the long run. You might read a strategy chart with the wrong tips. Avoid the worst blackjack mistakes and you’ll enjoy blackjack betting a lot more. Read tips sections like “Casino Pit Boss Confessions” to learn the most common mistakes blackjack bettors make. Blackjack Mistake 1 – Progressive Betting Tips: Avoid progressive betting like the Martingale, D’Alembert, or Fibonacci betting techniques. Martingale betting provides a lot of small winning hands, but when you get unlucky, you’ll risk losing your entire bankroll. Blackjack Mistake 2 – Online Card Counting: One huge mistake online blackjack players make is counting cards. Virtual blackjack in an online casino uses a random number generator, which reshuffles the deck after each hand. RNG reshuffles make card counting useless. Choose live dealer blackjack if you wish to count cards online. Blackjack Mistake 4 – Drinking Too Much: Whether playing with free drinks in a land-based casino or sampling from the liquor cabinet while playing online at home, avoid drinking-and-betting. The reason casinos offer free alcohol is it’s an investment. If you lack inhibitions while you play, you’re likely to make bad bets and chase after losses. Blackjack Mistake 5 – Bad Budgeting: Too many blackjack players make bigger bets than their budget allows, or stays at the table too long. Players should treat their bankroll like a budget. Money management helps you make realistic size bets while limiting the length of your gambling sessions. Blackjack Mistake 5 – Playing 6:5 Tables: Rules that stipulate 6:5 blackjacks instead of 3:2 blackjacks cost players the most money. If you see a single-hand table that pays 6:5 for a blackjack, the casino is trying to trick you into playing a worse game. Avoid 6:5 payouts always. Some blackjack advice doesn’t fit neatly into the strategy and rules sections. When you play blackjack for real money online, transition to online casino blackjack with a live dealer as soon as you feel comfortable doing so. Before you do so, practice blackjack online for free at a site like Bovada, Betway, or BetOnline, which allow practice mode blackjack in their software. The following blackjack tips focus on playing at online casinos. Remember that some rules found at land based casinos do not apply to the online casinos, which I’ll explain in the 5 Best Blackjack Tips below. Blackjack Tip 1 – Ignore the Law of Averages: Don’t assume that you’re “due”, or the table is either “hot” or “cold”. The law of averages is a gambling myth. When using a random number generator, each blackjack hand has no connection to the previous or the next hand. Instead, pay attention to the blackjack odds when making decisions. Blackjack Tip 2 – Don’t Take Insurance: Insurance is a sucker bet. Insurance pays 1:1 if you lose in certain situations, but those situations only happen about 1 times every 3 hands. That’s a losing proposition. Unless you’re a skilled card counter and the count calls for insurance (and it seldom does), avoid insurance. Blackjack Tip 3 – Use Flat Betting: Unless you’re a card counter, don’t vary your betting. Progressive and regressive betting styles don’t change the house edge. Instead, figure out the appropriate flat bet for your bankroll, then focus on basic strategy and optimal play. Blackjack Tip 4 – Split 8s and Aces: Many splitting tips exist, but two times you always should split is when you hold a pair of 8s or a pair of aces. Remember this blackjack splitting tip as the start of your knowledge on playing blackjack hands. Blackjack Tip 5 – Avoid Side Bets: Side bets have bigger payouts. Side bet also has a worse house edge than the main bet in blackjack. If you decide to play Perfect Pairs or Progressive Blackjack with your eyes wide open, wager on the side bets. If you simply want to play blackjack for the best odds, avoid side bets. Bettors will find many variations of blackjack at online casinos. Here are several of the most popular blackjack game variations. The best online casinos offer these games, including practice mode blackjack and real money versions. Keep in mind that black jack games have different names throughout the world. Before you start playing blackjack games for real money, read a basic strategy chart for each blackjack variant and play for free in practice mode to learn how to play. Classic Blackjack: Classic Blackjack is the name of the basic and most popular version of blackjack. This includes 3:2 for a natural blackjack, along with rules that allow splitting and doubling. The dealer hits on a soft 17 in this version. Pontoon: English Pontoon is a variant in which a blackjack is called a pontoon, while the 5-card trick in in play. The five-card trick is when you receive five cards without busting. Pontoon is popular in the United Kingdom. Australian Pontoon: Australian Pontoon is known as Spanish 21 in some online casinos. In this game, the Spanish deck (without 10s) is used, while hands built with 777 or 678 are given special payouts. Australian Pontoon is popular in Australia, New Zealand, and India. European Blackjack: European Blackjack forces the dealer to stand on soft 17 — a huge advantage for players. Unfortunately, the “No Peek” rule is in effect, meaning you lose the entire bet when the dealer has a natural blackjack. Doubling is more limited, too. European Blackjack is popular in Germany and Eastern Europe. Perfect Pairs: Perfect Pairs is a side bet in which you receive payouts when you receive a pair. A mixed color pair pays 5:1. A same color pair pays 10:1. A matching pair of the same color and suit pays out 30:1. This is found in most Microgaming and RTG online casinos. Zappit Blackjack: Zappit Blackjack plays like a combination of classic blackjack and 5-card draw. If you don’t like your hole cards, you can hit the Zappit button to receive 2 different cards. Zappit Blackjack is exclusive to RTG casinos, such as Bovada, Bodog, Slots.lv, and Ignition Casino. Blackjack Switch: In Blackjack Switch, the dealer deals two sets of hole cards to each player. The player has the option to switch cards between both hands in order to make a stronger hand. The drawback is you have an equal bet on both hands, so strategy is required to create the strongest set of hands. Double Exposure: Most black jack games deal one hole card and one face card to the dealer, meaning you only see one card. Double Exposure deals both dealer cards face-up. The drawback is the dealer wins on tie hands, along with a handful of other advantages. Progressive Blackjack: Progressive blackjack is played with a side bet which involves a progressive side bet. Online casinos feature many variations on the accumulated side bet. This has a big payout, but the progressive jackpot has a high house edge. Multi-Hand Blackjack: Multi-hand blackjack allows a player to wager on multiple hands at one time. This lowers the volatility of the game, but also allows high rollers to exceed the maximum bet limit on a single bet. Multi-hand blackjack is therefore popular with high stakes blackjack players. This article has reiterated several times that players should practice blackjack online for free. Whether you plan on gambling in a land-based casino or an online casino, playing online blackjack for free is a good idea for beginners. Free online blackjack allows you to learn the rules and master basic blackjack strategies. When it’s time to play blackjack for real money, you’ll be able to play optimal blackjack. The best online casinos allow account owners to practice blackjack using their software. US blackjack players can practice online blackjack for free at Bovada Casino, Slots.lv, or Ignition Casino. International blackjack players can play online blackjack for free at BetOnline Casino, 888 Casino, or Betway Casino. Playing for real money with a live dealer is the best way to bet on blackjack online. Blackjack with a live dealer gives a player the convenience and privacy of traditional online blackjack while streaming live hands of blackjack dealt by real-life blackjack dealers in real time. Live dealer blackjack is the best of both worlds, including the ability to count cards, because live blackjack is dealt from a shoe. Players can see the hand dealt from several camera angles, but be prepared to make decisions like you would in a brick-and-mortar casino, because other blackjack players will be seated at the table. Wagers tend to range between $5 and $5000 a hand. Now that you have an overview of the many options available to online blackjack players, you may want advice on choosing a reputable online casino in which to play blackjack. Legitimate online casinos for blackjack exist in the US, UK, and international gaming markets, but you’ll need to do your due diligence. Learn how to pick a trusted casino to play blackjack by researching a site’s gaming license, software providers, online reputation, and third-party auditing to assure fairness. Third-party auditors like eCOGRA, iTech Labs, and Technical Systems Testing (TST) are a few of the most respected auditing firms or watchdog organizations. The UK Gambling Commission is one of the most respected regulatory agencies, while regulators in Gibraltar, Malta, Kahnawake (Canada), Antigua and Barbuda, Curacao, Costa Rica, Panama, Alderney, and the Isle of Man also license online casinos. NetEnt, RealTime Gaming (RTG), Rival, Microgaming, and 888 are popular software providers you’ll encounter. Online blackjack can be fun and profitable if you know where to play, which variants to choose, and optimal blackjack strategy. Once you learn the online casino blackjack play rules and basic strategies, you’ll have the hard part down. Learning how to play at a blackjack online casino is easy. Simply follow the online blackjack casino signup guide below to learn how to play at an online blackjack casino. Step 1 – Enter the Online Casino: Sign in to your online casino account, or register if you have no account. Fund your account with Visa, MasterCard, Skrill, Neteller, Bitcoin, or several other deposit methods. Step 1 – Choose Blackjack Game: Casino sites have online, mobile, and live dealer blackjack versions. Once you choose which of the three you want to play, then click on the online blackjack variant you prefer. Step 2 – Placing a Blackjack Bet: Make a bet using your keypad and mouse, or with the touchscreen on your mobile device. Vary the bet by clicking on the virtual chip stacks, which usually come in denominations of $1, $5, $10, $50, and $100. Step 3 – Blackjack Strategy and Tips: Once blackjack hands begin, use a combination of basic strategy, money management, and card counting to achieve optimal results. Blackjack is a game of skill, so study and practice improve your results when playing online blackjack. Step 4 – Collect Blackjack Winnings: Once you win, visit the Cashier page to make a withdrawal of your blackjack winnings. The best online casinos provide several payout options, including bitcoin, web wallet, courier check, bank wire transfer. Step 5 – Study Basic Strategy: Remember, anytime you play a new variant of blackjack, you need to study the blackjack online table rules for that version of the game. Refer back to basic strategy charts if you forget which decisions to make while playing online blackjack. The history of blackjack spans centuries, as the game was created in either Spain or France during the Renaissance. Blackjack is at least 400 years old, because Miguel de Cervantes mentioned the game “veintiuna” (twenty-one) in Novelas ejemplares, a novel first printed in 1613. The game gained the name “blackjack” when it came to the New World, as American casinos paid out a 10-to-1 when a player received the ace of spade and a “black jack” — which was either a jack of spades or a jack of clubs. The first attempt to define blackjack basic strategy was in 1956, when the Journal of the American Statistical Association published the article “The Optimum Strategy in Blackjack”. This inspired Edward O. Thorp to write the first book on basic strategy and card counting, “Beat the Dealer”, in 1963. Since then, the science of card counting has been refined by waves of blackjack authors, who revolutionized the playing of blackjack for real money in casinos by giving blackjack gamblers a theoretical advantage.